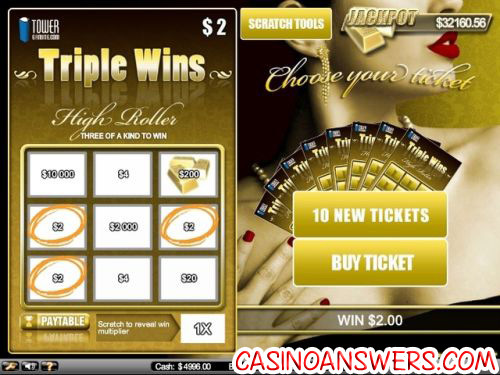 Triple Wins Scratch Card Guide & Review - Casino Answers! Triple Wins is an instant win online scratch card game developed by Net Entertainment, featuring multipliers and a progressive jackpot. You can play the Triple Wins: High Roller scratch ticket at Tower Gaming Casino and Betsson Casino. 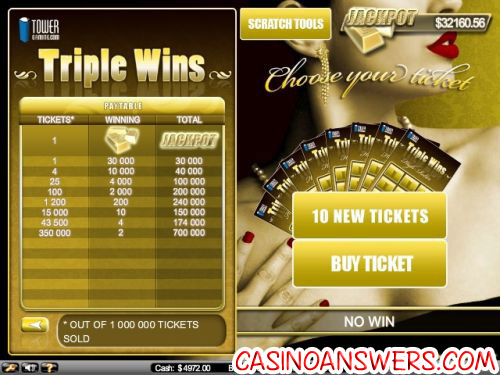 To start playing the Triple Wins online scratch card game, all you have to do is hit the “Buy Ticket” button. Every scratch ticket has a fixed value of $2. You will then be able to scratch each of the panels on the scratch card, which is accompanied by some nice sound effects and animation of the shavings coming off the scratch card, adding to the realism of the online casino game. You can use four different items (such as a penny or a ring) to scratch your ticket, which is a nice touch. Once you have scratched all of the panels, you must then scratch the multiplier. If you’d rather not scratch the card yourself, you can hit the “Scratch All” button and the game will do it for you. The Triple Wins scratchie consists of a 3X3 grid of panels to scratch. You must match three prize values (in Dollars or Euros). Once you have finished scratching a panel, the border around the panel will turn yellow, indicating a sufficiently scratched panel. If you have a winning ticket, the game will circle your winning panels. The Triple Wins scratch and win lottery game has a progressive jackpot, which is currently at $32,160.56 at the time of this writing. To win the progressive jackpot on Triple Wins, you must scratch three panels with the gold bars in the background. There will still be a prize on the panel in addition to the gold bars jackpot symbol. The fun isn’t over yet on the Triple Wins scratch card. After you have scratched all 9 panels, you will also get a multiplier of 1X, 2X or 10X! A 10X multiplier can turn a $2 winning ticket into a $20 winning ticket, so it’s a very valuable panel on the scratch card. Triple Wins is a fun scratch card with some nice touches that we enjoyed from Net Ent. It helps that the scratch card has a progressive jackpot, making the possibility of winning big very realistic. You can get an easy to clear 100% up to $100 signup bonus to play the Triple Wins: High Roller scratch card at Tower Gaming Casino. Are American players able to play the Triple Wins scratch card for real money? Unfortunately, Americans players are unable to play at casinos that use the Net Ent software. With that said, they can play similar instant win scratch card games at USA-friendly online casinos such as Aladdin’s Gold Casino. Do I need to download any software to play Triple Wins? Absolutely not! Tower Gaming Flash Casino has some of the best Instant Play software around. If you experience any issues playing the Triple Wins scratch card in your browser, try installing the latest version of Adobe Flash Player. Where can I play the Triple Win scratch and win instant win game? You can play Triple Win at either Tower Gaming Casino and Betsson Casino. For more information on these casinos, please read our Tower Review and Betsson Review. What casinos have the triple wins scratch card?